This is the first sentence in The BFG, one of my favourite childhood books, and I’ve always loved that opening line. As an on-and-off insomniac, I know that when you can’t sleep it can be pretty rubbish, but I like this line because it reminds me that sometimes, not being able to sleep can bring adventures. Tart-shaped adventures may not sound as exciting as giants, but adventures they remain. 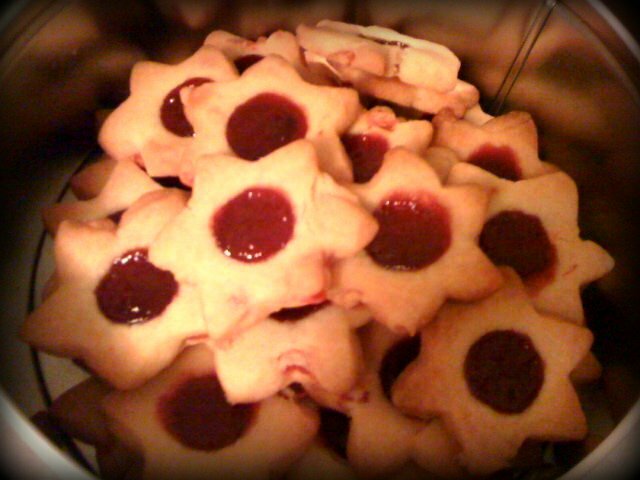 And star-shaped biscuit adventures are just awesomesauce. At half past eleven a few weeks ago, I realised that yet again my body had decided to forego sleep in favour of making my brain go something like this. Instead of watching endless stupid Youtube videos (which is how I came across that last one, as it happens), I decided to do something productive. At 2am I finally finished, and I slept better than I had done in weeks. They used hearts as you can see on the online recipe, but I used stars because they’re a bit less vommy. And lead to far less “Oh, I’ve broken your heart!” or “GO ON – TAKE ANOTHER LITTLE PIECE OF MY HEART!” jokes. I know my colleagues too well. Also, if you’re not a fan of cherry then feel free to use raspberry or apricot. They work equally scrumptiously. The other point I will make is not only will you probably need more flour than that stated (I probably used another 30-50g), but you really should put the dough in the fridge for a while before you roll it. Much less sticky. I really only picked this one because it meant I got to announce it at work in an Italian accent and sound all foreign. But Cavolo Nero is essentially Kale. A bit less romantic but delicious nonetheless. Oh, and whatever you do don’t ask anyone at ASDA if they sell ‘baking beans’. It leads to scenes you wouldn’t even expect in a badly-written sitcom that make you do a bit of a cry. Heat oven to 200C/180C fan/gas 6. Roll out the pastry and use to line a deep 20 x 30cm loose-bottomed tart tin or 23cm round tin. Prick the base and line with greaseproof paper and baking beans. Sit the tin on a baking sheet and bake for 15 mins, then remove beans and parchment and return to the oven for a further 5-10 mins until pale golden. Lower the oven to 180C/160C fan/gas 4. Meanwhile, trim the cabbage and separate the leaves. Cook in a pan of lightly salted boiling water for 4-5 mins, until tender. Cool and drain well then squeeze out any excess water. Pat dry with kitchen paper. 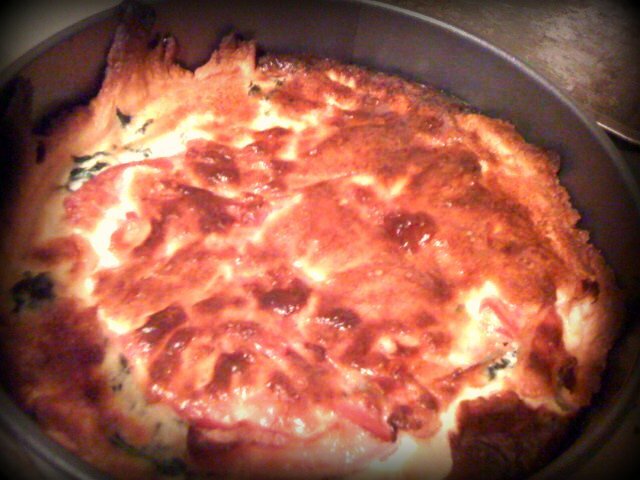 Arrange the cabbage leaves and pancetta slices in the tart case. Beat together the milk, cream and eggs until well blended. Stir in the Parmesan and some freshly ground black pepper then pour into the tart case. Bake for 25 mins until just set. Leave to sit in the tin for 10 mins then carefully lift out, cut into slices and serve while still warm.